If you’re in the market for a new canal boat and like us, totally appreciate the importance of a well refined design, you’ll hopefully be enthused to have found The Fit Out Pontoon – the only independent canal boat design consultancy. Our Narrowboat & Widebeam Design Service is hugely beneficial for buyers of brand new fully fitted canal boats, and equally for those looking to buy sailaways for a self-fit out. The ‘All In One’ Design Service is just this, beginning with a half day consultation where we encourage our clients to bring all their ideas and questions to run through. This is followed by the design development and refinement process which completes with the production and supply of full set of technical drawings. Email pdf drawings to builders for accurate build quotes – no hidden costs! If you’re aspiring to own a canal boat that’s individually built and designed specifically around your needs, a thorough and professional design process is essential. Its crazy really in the housing market you wouldn’t dream of building a house without a detailed set of plans, yet as a whole in the canal boat industry this side of things is all too often overlooked! If you haven’t already thought about it, a canal boat can only ever be as good as it’s design. Our ‘All-In-One’ Design Service literally brings your boat to life, together we’ll follow the design process from concept to fruition to ensure the internal layout of your canal boat is perfectly planned down to the inch. 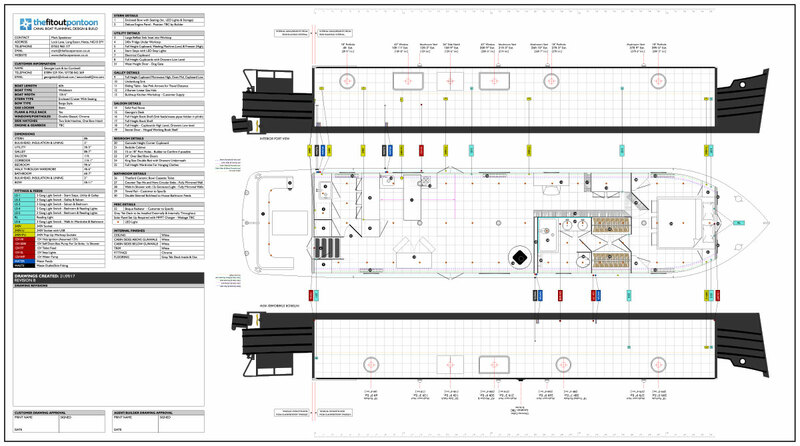 With our impeccable drawing skills you’ll be able to visualise your canal boat with absolute clarity, because to complement the design process our ‘All-In-One’ Design Service includes a detailed set of manufacturing drawings. Produced and printed to 1:25 scale these drawings are the perfect focal point for everyone involved to plan, work and communicate from. You might be asking yourself… What’s the benefit of bringing The Fit Out Pontoon into the design process? To make an informed decision take a little look further down this page at some our customer drawings and note the level of detail and quality of our execution. By all means, don’t just take our word for it, open this TRUSTPILOT link and read what our customers have to say now they’ve been through our design process. It’s then just a case of asking your builder about their design process, how it works and what level of drawing detail you’ll receive. At this point you’ll probably agree with our customers that commissioning The Fit Out Pontoon will safeguard your investment and play a positive and pivotal role in your canal boat build. Our ‘All In One’ Narrowboat & Widebeam Design Service is much more than just a design service, we begin the process with a one-to-one design consultation where you’ll gain invaluable information, contacts, product knowledge and advice from a team of designers who combined have over 20 years live aboard experience. The early part of the consultation is focused around gaining as much information from you as possible. The idea is to fully understand why you’re buying a boat, whether it’s for leisure or residential purposes and how you’ll be using it. With all this information at hand, together we will develop a comprehensive list of on-board requirements, equipment and appliances – an essential initial stage of the design process. This is also a great opportunity for you to run through any canal boat related questions and we encourage you to bring along a pre-prepared list. We also urge you to come to the consultation with sketches, proposed layouts, photographs or any other inspiration you have to hand. During the second part of the consultation we’ll take a detailed look through your material to gain a better understanding of the style of boat you’re looking for. Quite often we’ll get chance to start developing some basic layouts, proving or disproving ideas and concepts we’ve talked about during the meeting which is an ideal place to finish the consultation. Following on from the design consultation we’ll have gathered ample information to start putting some basic design proposals together for your consideration. Generally we evolve the designs and communicate them with you via email and/or telephone. For those a little more computer savvy, we do find considerable benefits from Skype calls as we can take full advantage the facility to share our computer screen and work with you over a live video call. We developed and refined our design process to maximise efficiency, we initially concentrate on the overall layout, once we’ve agreed this we’ll begin to look at the window, hatch and vent positions, followed by the plumbing and electrical details and finally we’ll look at the lighting circuits. Once we’ve finalised the design we’ll put together a final design drawing. Our completed narrowboat and widebeam design drawings have evolved over many years and are well-respected within the boat building industry. 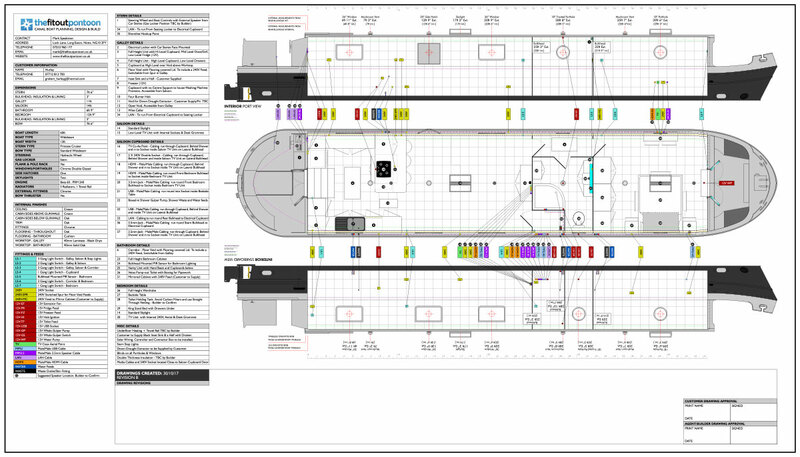 Through just one drawing we are able to simply communicate the hull and aperture details for the initial fabrication, list a detailed onboard specification, clearly illustrate the interior layout, materials and finishes (including itemised descriptions) and show all the plumbing and electrical detail. In-house we have a large format printer printing high-resolution up to A1 size. We supply two sets of drawings, one for yourself and the other for any builders/fitters you’re working with. These are packaged within a parcel tubes to help protect them for the duration of the build process. For customers purchasing sailaways, we even supply two totally separate sets of drawings illustrating different details. A set for the boat builder which only communicates the details they’re interested in (this will vary depending on whether it’s a sailaway basic, sailaway lined or additions) and the other drawing set will communicate the fully fitted details.